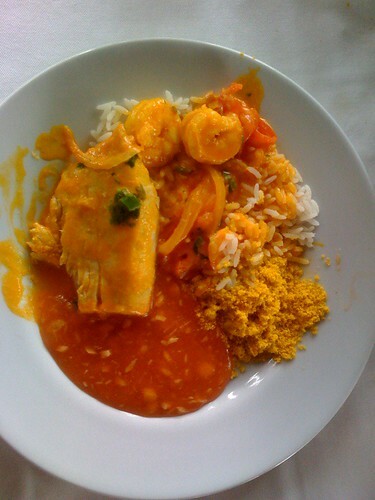 Last week one of the students in my Portuguese class invited everyone around for dinner and not just any dinner, but my favourite Brazilian dish, moqueca de peixe. Unfortunately, I don’t have a great rapport with the other students in my class. This is because they are all a little more advanced than me and we don’t really talk to each other in class as most of our conversations are through the filter of our teacher. However, they seem like nice people and I can never resist that particular recipe. Furthermore, it was a very generous invitation and it would have been churlish of me not to go without a good reason, so I went. Moqueca de piexe, courtesy of Carla Arena (@carlaarena). Over the course of the evening, we chatted, as you would expect, and I found that, unbeknownst to me, Maria* teaches conversational French, that Sara spent a great month in Manaus in Brazil but didn’t like Rio at all, that Bob had a lovely Christmas in London with his girlfriend, and our host Michelle paints, specialising in pictures of Brazilian life. The thing is that we have been in the same class now for nearly a year, and it’s taken me that long to find out these things. Putting my teacher hat back on, I can’t help but wonder how the classes might have been different if we had gotten to know each other better. 1. Set a personal example with your own behaviour. 5. Increase the learners’ linguistic self-confidence. 8. Personalize the learning process. 9. 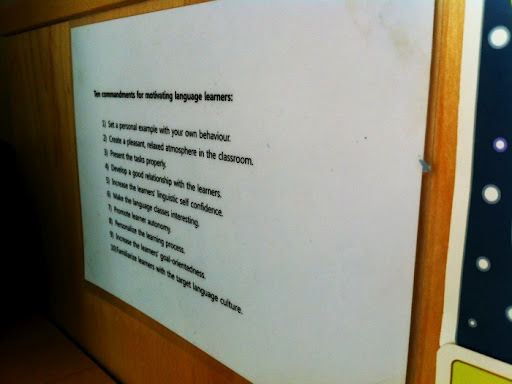 Increase the learners’ goal-orientedness. 10. Familiarize learners with the target culture. Looking at numbers two, four, five, seven and eight on Czizer and Dornyei’s list, it seems to me that creating a rapport between students is either fundamental or mighty useful in each case. This sense of rapport enables the students to become more involved in the class as an entity, irrespective of the subject being studied, but with the benefit that their involvement in the class increases and subsequently so does their knowledge of the language. When you teach adults in EFL as I do, you must not underestimate the social nature of what it is that we do. Language lessons are not the most academic in the world and they are often undertaken as a social activity by people who have two hours of lessons a week and don’t always have time to do their homework. ** Don’t misunderstand me, there’s nothing wrong with that and there’s nothing to apologise for. I’m not suggesting that we shouldn’t take our jobs and profession seriously, far from it in fact (I hope this blog is proof of that!). But my point is this, that on a very basic level, many of our students want to enjoy their classes. They want to progress and reach their own individual goals. Our job as teachers is to help them meet those objectives in a motivating and interesting way. To do this, we have to recognise that a class is a social construct. It is a group of people, all with different needs, objectives and learning styles. It is necessary for these people, these social animals, to do what comes naturally to us: to interact and create bonds. Essentially, if you don’t allow your students an opportunity to get to know each other, then I think you’re making it much more difficult than it needs to be. The Ten Commandments, right by my side. **Incidentally, I am aware that there are also learners who are quite different situations, whether they are refugees or people who’ve been told to improve their English or they will lose their job. I don’t think this approach to motivation applies to them any less, it’s just perhaps harder to justify to administrators and the like. So true! I don't teach adults but I did take a Spanish course and this certainly is an important factor! I completely agree, James. I think it's essential that the learners get to know each other, feel comfortable with each other and enjoy each other's company as far as possible. We use language to communicate, so the more people we feel inclined to communicate with in the language we're learning, the better. And, even in countries where the language being learned is widely spoken, learners will not have access to social activities using the target language. The classroom can provide, not only language instruction or practice but also much needed opportunities for authentic language use and socialisation. Nice post, James. I couldn't agree more. A good relationship between the learners and between the learners and the teacher is so important. So is a relaxed atmosphere as for many learners, especially the weaker ones, the classroom has to be a place where mistakes can be made, where things can be tried out. These ten commandments are indeed great guidelines. As a teacher, I know I have to work more on number 7. I am currently studying to be a teacher. This post is brilliant. The list is extremely useful and it has inspired me to look into it further. Just so I'm clear you are a language teacher in Brussels and you also learning to speak portuguese? Thanks Naomi. I get a feeling this is important for kids too, but I'm not in a position to say how or why! Thanks Carol. That's a very good point you make about ESL and the lack of real, social opportunities for students to practice outside of the classroom, despite what many people think before they start their courses. And you're right too when you mention communication, that's what it's all about after all. Absolutely Mieke. The thing is that this won't just happen naturally, it has to be worked on and engineered by the teacher. It takes thought and consideration, and you have to get to know your students to make it work. It's not as easy as seems. Hi Tania, that's a good rule you have there and one I'd like to think I'd use myself. Of course, we also have to try and take into account people who have different needs and expectations and what they expect from the class too. Thanks Ahmet, that's very kind of you. Good luck with your studies. Interesting, you highlighted the social factor where learning happens. Learning contextualized by in the social environment is much more effective. I think. However people consider social activities more connected to amusement or “just have fun” than “serious work”. I am researching about educational games and frequently I need to handle this issue. I will suggest your blog to some friends. Of course it is, but I”m speaking from the point of view of a classroom teacher in a national school. The kids know each other “inside out!”. Especially my special ed kids. If kids are in a language school or summer program the situation you described holds true for them too. I see what you mean Naomi. Thanks for clarifying it. Thank you for your reply James. I'm at Middlesex University. Part of my course is to critically reflect on people with my industries blogs. I wonder if it would be beneficial to extend your profile a little more. I have looked into the profile early on in my course. I feel it's job is to tell your story of who you are? I really like the end line and like the warmth it brings. Did you keep it short for a reason? Thanks for your feedback Ahmet. I guess I kept it short because I don't like to waste people's time, and because initially most people reading this blog already knew who I was. Maybe that's changing, so I might add a few more details. Cheers! Thanks for your comment and kind words Renato. It's much appreciated. I agree with you that the distinction between “fun” and “serious work” is unhelpful and ultimately reductive. Games can be very useful aids to learning, I have found. Timely, perhaps. It's about this time of year (just before the end of the academic year here) where I start to reflect on whether or not I got to know my students like I could have. On a personal level, that reflection usually ends in a disheartening 'no'. Next year, I'm sure I'll make that vow again. I do wonder sometimes if any of my students really enjoy the academic classes they must take in order to proceed into their undergrads. Often they look at it as a means to an end and we, as instructors, look at it as a serious endeavour that requires very specialised, very thoughtfully constructed elements, which games, educational or not, rarely play a part. I know their value, particularly when I taught conversation-driven classes. But you're right, the learners no matter the class have different personalities, different ultimate goals (beyond passing this year) and different expectations that can or cannot be met. Keeping this in mind is important. Thanks for your comment Tyson. It's tough, when the number of students you have number in the tens or more, to really get to know your students the way you'd like to. What will probably happen is that your get to know the most outgoing and friendly ones, and the shyest will remain a mystery. That's not necessarily our fault. What I do hope is that they all got to know each other well. My best classes were ones that bonded together and became a little group of their own. I wasn't part of this, nor should I be, but it helped my rapport with them because I could get to know the group, rather than a room of individuals. I wonder about this enjoyment you describe. We automatically assume that serious subjects need to be taught in serious ways, but I wonder if that's actually true. Can they still acquire the same language skills in a more relaxed mode? What do you think? I think there is some face validity by keeping things to a certain serious manner, much of the time, given the context, cost and stakes to passing the program (they will or will not be able to go into their chosen undergrad programs at this university–no second chances). Having said that, I do believe that more modern tasks, like collaborative blogs, can bridge the gap between this face validity and enjoyment. The relaxed mode may more appropriately come by way of my attitude in class itself and how I interact with students in class. Of course, it comes down to personality and expectations again. For the bond, let me not underemphasise the cliques that have formed over the last 24 weeks! It's inevitable. I notice them and am glad that certain relationships have formed, but I'm also outside of it all. In fact, I find it a little amusing to see their reactions to preformed groupings.